If you've ever thought that your go-to hot pot restaurant was missing a sophisticated high tea flare, then J'Adore Hot Pot might be what you are looking for. Once the initial shock of the French inspired decor wears off, you'll quickly realize that you're in for a hot pot treat! As a pescatarian, I often shy away from hot pot because my partner in food is an avid meat eater, and sharing a big pot of soup that has been cooking his beef doesn't really appeal to me. J'Adore hot pot allows relief for those with varying dietary needs and tastes by having individual, adorable pots to cook in. There is a huge selection of soup bases to chose from including Soy Milk Soup, Chanko Nabe Soup, Korean Kimchi soup, Coconut Curry Soup, Tomato Ox-Tail soup, Mushroom Soup, Tom Yum Soup, and Black bone Chicken soup; to name a few. We were welcomed with a red bean paste appetizer with a dried rose garnish and a selection of teas. We tried the Pineapple and Honey tea, and a blooming flower tea. Both were fantastic and a great way to start off a delicious meal. Once we selected our soup bases (Mushroom and Tom Yum were our final choices) the “All You Can Eat” (AYCE) food came out at a steady pace and we were never left without something ready to go into the soup. It is unbelievable the amount of food to choose from ranging from lobster tail and tofu, to tripe and short ribs. If I were to list everything that we tried you would be reading for days. Fresh greens and cabbage, along with a selection of different mushrooms were also always at the ready to add to the soup. The unanimous favourites from the first round of food were the Canadian Lobster Tail and Alaska Snow crab legs. Since there are so many different types of soup bases, the flavour palate is literally endless and completely up to you. I don't know that two people would have the same experience here. Once the second round of food came out, including shrimp cakes, and short ribs, I added some heat and garlic to my soup base from the "spice bar" where you can add as much or as little from the onions, pastes, and chili flakes to name a few. While it is really up to you how the food is cooked and seasoned at most hot pot restaurants, I can easily say that the presentation at J'Adore hotpot is what is so special and unique about this place. The food could have easily come out on a plate and tasted just as good, but seeing the food presented on a high tea-esque tiered display makes you feel kind of special. While you're busy waiting for your food to simmer, a barbecue skewer selection is presented and placed on your mini grill in the centre of the table. This included beef tongue, and stuffed chicken. If you haven't overdone it by the time the AYCE parade stops, then you can cap off the meal with chocolate fondue. Hands down the best part of this meal is the soup base selection. While none of the soup bases are initially vegetarian/pescetarian friendly, the kitchen is more than willing to use the same flavours as their standard soup bases, and make the base without a meat stock. The staff was also extremely careful to refill my pot with hot water instead of the hot stock. When you eat here you've got to try the Snow Crab, Lobster tail (might as well just go ahead and get the whole seafood platter while you're at it), the Shrimp Cake, and so I'm told, the short ribs and meatballs. If you've got a tart tooth, go ahead and order their homemade plum juice! 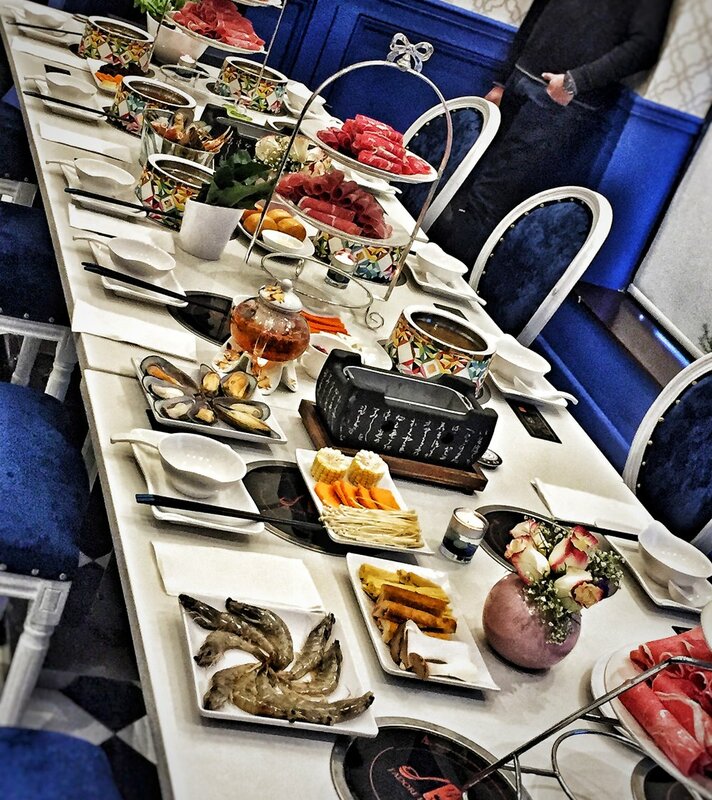 Overall, get ready to feel fancier than you ever have before at hot pot. From the outside, you might not have any idea what hides inside - I highly suggest you take a look for yourself! It is a totally unique experience to any other hot pot you've ever had - I can guarantee that.